The Gym Monkey Bars is one of our large monkey bar sets that is perfect for a growing family, at home daycare center or as part of a school or community playground area. It has two full monkey bar runs crisscrossed at the center. This means there are 4 points of entry onto the bars – giving a group of fun-loving kids lots of room to wiggle on and swing around. The Gym Monkey Bars outdoor playground equipment will allow your child to challenge themselves and strengthen their muscles by swinging from rung to rung all the way across to the end and back to center to change direction. An added benefit is the reinforcing of the child's eye-hand coordination that using monkey bars will do, help your child's large muscles in the arms to develop and stay fit. These are a must have piece of playground equipment. Safety, as well as fun is of chief concern at CubbyKraft. 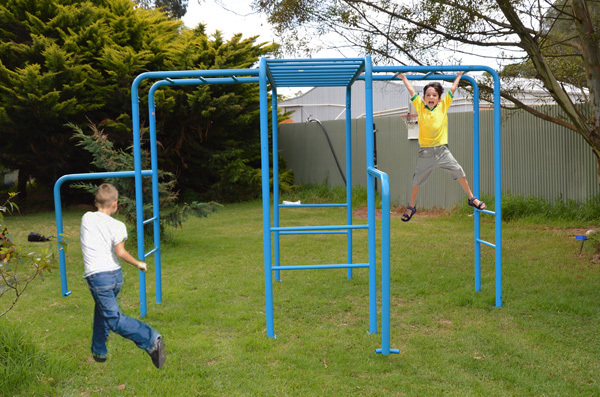 Finest materials were used to develop the Gym Monkey Bars set, which makes it is rust free and extremely durable piece of outdoor playground equipment. The height of the bars is at standard levels to ensure safety. The Gym Monkey Bars are available on their own or they can be part of an entire backyard playground with swings, cubby forts and cubby houses. Take a look around our site to see all that CubbyKraft has to offer - you won't be sorry you did! 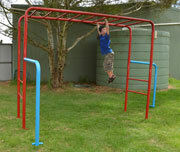 The Gym Monkey Bars kit can be shipped anywhere in Australia. It can easily be assembled by anyone by just following the guidelines provided with it. Do-it-yourself consultants are always available to give you a hand through email and over the phone during normal business hours. Instructions are clear and easy to follow, clearly labeled you will be able to put this together and if your children are old enough, you may want them to help. It will make them feel like they had a special job building their own monkey bars.